(Last update : Apr 29, 2017- See Comment#9) Highly customizable one-piece skin for Rainlendar 2.13 (it won't work with previous versions). Expand the TodoList by stretching the window slightly to the right, and the EventList by stretching it to the bottom. 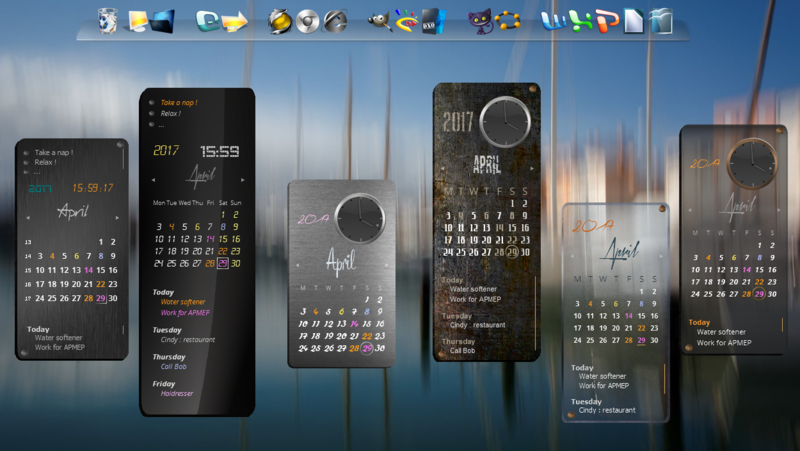 Choose between 6 backgrounds, a digital clock or an analog one (or none), use your own fonts and get exactly the skin you need by changing a couple of settings in the Windows/Settings/Calendar variables (take a look at the screenshot : it's the same skin with various settings...). Suggestions to improve that skin are welcome ! Of course, don't forget to rename the Harrys5Monoblocks.zip file into Harrys5Monoblocks.r2skin before to drag and drop it on a rainlendar window. My image appears to be corrupted. Any idea why? Euh... Never seen that before ! Just a question : Is your TodoList Empty ? EDIT : I think the problem is related to your Rainlendar version : before 2.13, windows could'nt be resized with the mouse (and it's needed here : the x and y position of each element aren't fixed but computed depending on #width#, a variable that gives the width of the resized window). Could you check for an update and tell me if the problem is solved ? Anyway, thanks to have reported this issue, Gevansmd ! My image appears to be corrupted. Any idea why? Euh... Never seen that before ! Just a question : Is your TodoList Empty ? EDIT : I think the probleme is related to your Rainlendar version : before 2.13, windows could'nt be resized with the mouse (and it's needed here : the x and y position of each element aren't fixed but computed depending on #width#, a variable that gives the width of the resized window). Could you check for an update and tell me if the problem is solved ? Anyway, thanks to have reported this issue, Gevansmd ! That was the problem. I installed v 2.13 and the image is no longer corrupted. Thank you! 1.2 version : Month's name was too close to calendar's days when using the analog clock. I've just uploaded an adjusted skin. New upload today (may be the last if no one asks for an improvement... For me, I don't see anything to add !). - You can use a silver scrollbar instead of the golden one. - You have the choice between five settings for "Today"
- It was difficult to read days with rusted metal background : there was too much colour contrast. It's more usable now. - You can choose separately default font color for text and events. Ok. I've tried several times to download and install your skin but it keeps going into an image file. It also has a xml file with it. What am I doing wrong here? Did you use the "Download" button (on the line were it's written "12 comments" and "0 referal") ? I've just tried it : it works ! You'll get Harrys5Monoblocks.zip that you'll have to rename into Harrys5Monoblocks.r2skin before to install. Il you click (right or left) on the picture, you'll just get... a picture ! Hi, I'm competely new to skins. I downloaded the zip file, renamed it and dropped it into the skin folder, and then selected it as the skin from within Reinlendar. Although it says the skin loaded suscesfully it doesn't look any different. Am I doing something wrong? You have to right-click on a rainlendar window, select "Options"/"Skins", search "Harrys5Monoblocks", click on the "+" before and, with the right arrow, put "Alarm", "Tooltip", "TrayIcon" and "Calendar" in the "Active Skins" window. If there was already something in this window, you have to delete it before with the left arrow (either you'll have two different calendars on your desktop).